SpartanNash Co. edged past Wall Street’s earnings forecast for its fiscal 2018 third quarter, even as declined sales in its retail grocery and military businesses shaved revenue growth. In reporting quarterly results, the food wholesaler and retailer also said it has retained Harvest Earnings, a third-party advisory firm, to help “transform our culture” to engage employees at all levels and field ideas on how to operate more efficiently and better serve customers to spur sales and profits. For the 12-week quarter ended Oct. 6, SpartanNash tallied sales of $1.89 billion, up 1% from $1.87 billion a year earlier. Driving the gain was the food distribution segment, which saw sales climb 4.6% to $940.2 million from $899.2 million a year ago. The Grand Rapids, Mich.-based company attributed the increase mainly to sales growth from existing and new customer programs. Retail segment sales dropped 3.7% to $446.3 million from $463.6 million in the prior-year period. SpartanNash said the decline stemmed primarily from $15.1 million in lost sales due to the closing and sale of stores and a 1.9% dip in same-store sales (excluding fuel), which were partially offset by higher gasoline sales. 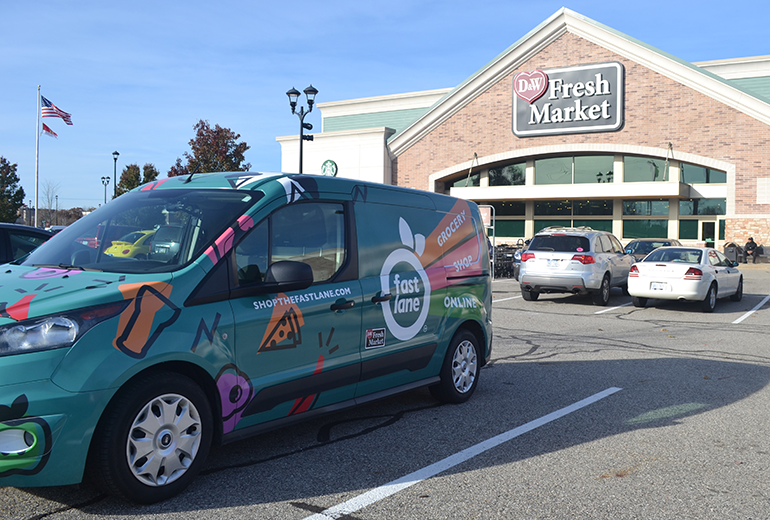 Currently, SpartanNash operates 139 supermarkets, mainly under the Family Fare Supermarkets, D&W Fresh Market, VG’s Grocery, Dan’s Supermarket and Family Fresh Market banners. Revenue for the military segment came in at $500.2 million, down from $505.6 million in the 2017 quarter. At the bottom line, SpartanNash posted third-quarter earnings from continuing operations of $17.5 million, or 49 cents per diluted share, compared to a loss from continuing operations of $123.5 million, or $3.31 per diluted share, a year earlier. Adjusted earnings from continuing operations were $17.9 million, or 50 cents per diluted share, versus $20.1 million, or 54 cents per diluted share, in the prior-year period. Analysts, on average, projected adjusted earnings per share (EPS) of 48 cents, with estimates ranging from a low of 40 cents to a high of 54 cents, according to Thomson Reuters. “We are taking action to become a growth company that is focused on developing a national, highly efficient distribution platform that services a diverse customer base by leveraging our complementary business segments of food distribution, military distribution and retail. During the quarter, we continued to make progress for the achieving elements of our strategy,” SpartanNash President and CEO David Staples told analysts Thursday in a conference call. Those strides include efforts to improve the core distribution network and identify opportunities to enhance supply chain capabilities, including steps to better serve both the east and west coasts, he explained. In the military segment, SpartanNash is leveraging its distribution capabilities to fuel future growth, while the company is moving ahead with its brand repositioning program for the retail business. Under that initiative, SpartanNash completed three store remodels in the third quarter and two early in the fourth quarter. That effort is slated to get under way in December and will involve all staff, ranging from those working in retail stores and distribution centers to those in the corporate offices. Looking ahead for the full 2018 fiscal year, SpartanNash forecasts earnings from continuing operations (GAAP) of $1.66 to $1.75 per diluted share, compared with a loss of $1.41 per diluted share in 2017. Adjusted EPS from continuing operations is estimated at $1.89 to $1.97 and excludes merger-and-acquisition and integration costs, restructuring charges and other adjusted items. Wall Street’s consensus forecast is for full-year adjusted EPS of $1.99, with projections running from a low of $1.97 to a high of $2.02, Thomson Reuters reported.